savior of lives, shaman of visions. by her fire when traces of dusk have vanished. We follow the moon moth to Oloa’s fire. Soleil broke into a sweat. She kept her breathing calm, but why sweating? The music was intense, but this wasn’t a usual reaction. Her life had been generally free of present danger; feeling it now, she didn’t understand it. Soleil couldn’t move or squeeze her hands, holding her grandmother’s and cousin’s. Her body was unresponsive to command. Tendrils of panic arose in her thoughts. Something is wrong, nothing is cooking. Lysha begins calling the other warriors by name to join her. The music turns darker, urgency rising in tempo and timbre. Easing herself into a state of detachment, Soleil guessed she was having an adrenaline response with night terror paralysis. There was a distinct pulse in what felt like a physical place in her skull. Soleil’s senses dimmed as though someone was squeezing her life in their fist. Her detached self understood that this wasn’t a mortal sensation – it had a distinctly neural quality, like the traces of iron in water. The animal core of her, however, was a rearing, frightened horse locked in and tied tight. 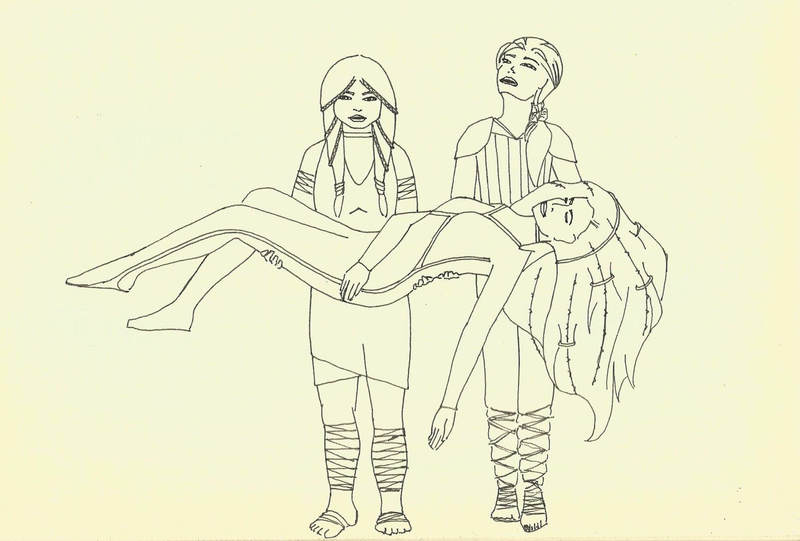 The dead shaman Oloa was carried out from backstage in the arms of Lysha and Neris. Soleil focused on her through pulses of blackness. It was a bright enough sight that it was something her mind could hold onto, even as it seemed somehow to be failing. 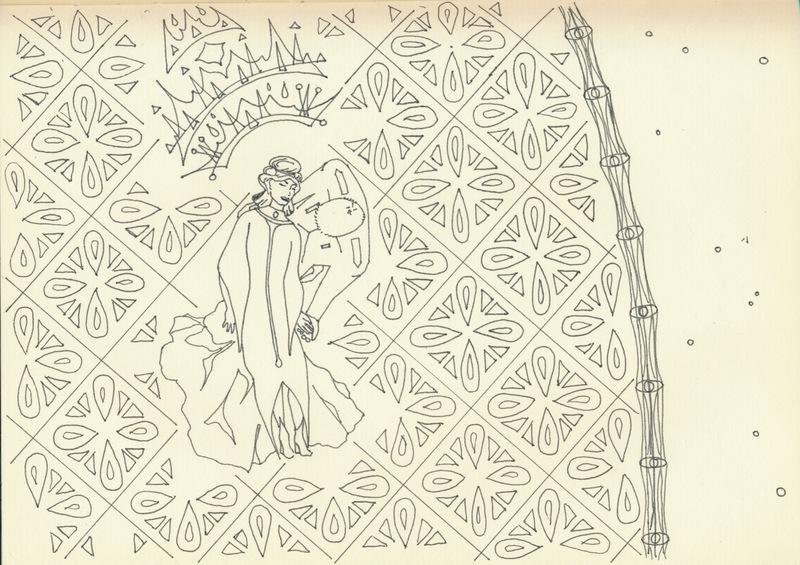 Traditionally, the shaman is a role of honor, the silent star of this piece. She emerges only this once in her full regalia, and she is already dead. This costume, not bound by any enduring or definite character, is often an homage to an ancestor or elder. On this stage, Oloa’s skin was black as night, her hair a voluminous dark fall including many strands of pulsating, soft rainbow light. This was bound in uncountable loose sections by loops glowing with the same light, as did the stripes down the sides of her fitted black bodysuit. Their dead shaman was a glowing, alien anachronism, lit up and supine as a martyr in neon; pitiful as a firefly’s last dance. This assembly of glowing swoops and halos anchored Soleil’s vision. When she became certain that she could either cry out, or that her mind would cave to whatever was attacking it – the sensations fled, leaving the barest trace on her memory. As though she had eaten spicy food. The four women onstage were now singing the memorial verse, setting the shaman onto a bier, covering her, and raising her up. Soleil’s mind was reflexively healing its trauma, covering its tracks, but she took note before it could erase them completely. Should mention this later, though to whom? Very unusual. The entire ensemble switched to percussion, beginning the battle verse. spread it and the driving rain that ends it. Soleil rose to her feet with the rest of the front row. She was clapping. With bewildered sarcasm, she noted that her hands and feet were now working just fine. She smiled, and all the cameras looked at her. The data on Karma’s display turned green all at once, and collapsed into a single flashing dot. Her computer and the safe emitted a small beep. As she reached toward them, a hovercar dropped into view, and the window wall by the bed exploded in shards. Derringer hit the floor and looked up. Karma, crouching, reached up and grabbed both devices from the desktop. “I thought you weren’t followed,” she shouted as she took cover. From her jacket she withdrew a custom automatic pistol. 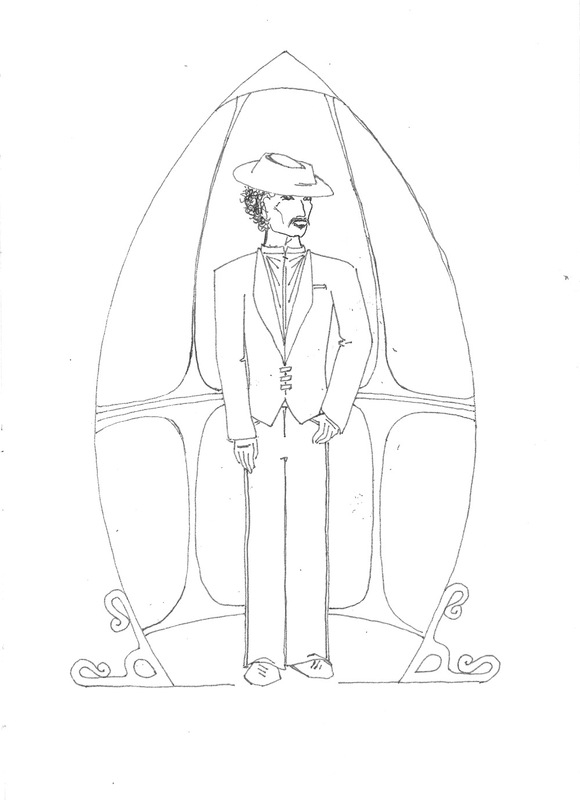 Derringer lunged over to the portal and slapped the frame, calling the elevator. A few bullets struck the frame and the wall nearby. “Did you ask yourself that question?” He got himself behind a corner in time to hear her fire three shots. Sticking his head out to look, he saw both men down, one conscious. “I saw it as an eventuality,” said Karma, reholstering her piece. She sent him a wink before crossing the room and withdrawing a rocket launcher from under the bed. 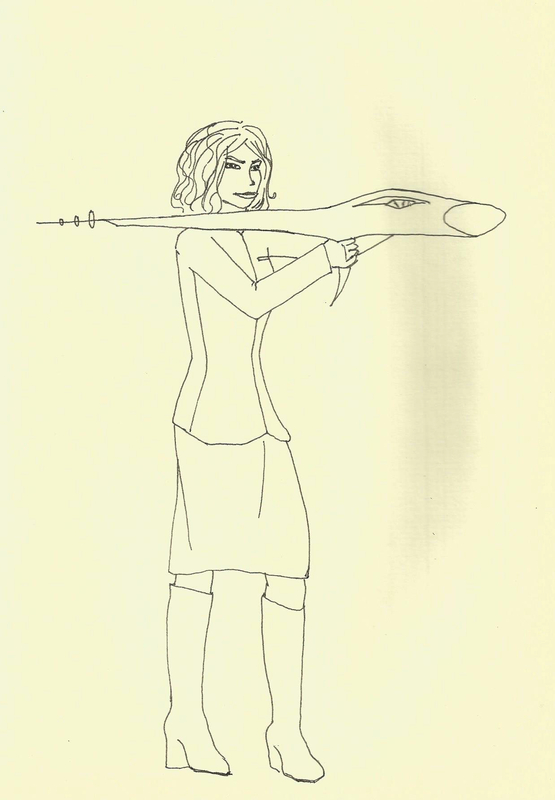 Firing from her shoulder, the rocket plumed a white smoke trail to where it collided with the hovercar outside. They felt the waves from the explosion as the flier fell from view. Karma dropped her weapon and headed for the elevator just as the frame illuminated and the door slipped open. Derringer launched himself after her and they were in together. “Either my people, who booked the room, or their people, who blew it up. We’ll see!” The elevator detached itself from the building, but instead of going down its appointed route to the ground floor, they headed round to the other side of the building. Her computer chimed, the beam disappearing as she slipped it back into her jacket. “Where is this going?” asked Derringer. “Service entrance,” she replied. He relaxed, loosening his joints and smiling a little. This could be fun. He was empty-handed, only a minor disadvantage. When you need a weapon, there’s usually something at hand. Karma turned to face him. “I can get us out. Stick with me till we’re clear, then you’re free as a bird.” Derringer nodded, though he intended to learn a little more about what he was just dodging bullets for. The moment the door began to open, they squeezed through and took off down a hallway packed with cleaning carts, linen piles, open supply closet doors and people. Karma was nimble even in her boots, and Derringer enlarged her wake. One man attempted to get in their way, and Karma dodged past while Derringer lightly flipped him down. Karma tapped a code into her computer. Ahead of them at the end of the hall, the door to the service elevator shaft slid open. “Going down?” Derringer yelled. She flashed him a look. “Yes.” Must have thought she was the only one here who’d ever planned an elevator escape. The sounds of confusion were rising behind them. After a pause, she nodded. “Okay. It’s on the right.” Derringer caught the edge of the opening, with his left hand finding the maintenance rappel device against the wall of the shaft. He hooked it up with the center of the cable, jamming the lever down to keep it steady. With one side, he hung onto the hook slider. Karma stepped into his other arm, hanging onto his shoulders and wrapping around his free leg. He could feel the pistol under her jacket against his side. He jammed the lever up, the door closing as they dropped out of sight. the shadows dapple and rise. Everyone inside, this is a huntress’ time. no greater devils than we! Margeaux felt a strange hunger in her muscles and the music. Wriggling inside her skin, she saw herself crawling through growing darkness. The lyrics were sung in Old Indar, which meant Margeaux understood every fourth word, but she could hear it in the musicians, and Kamini’s voice. She had the urge to grin ferociously. The Queen was smiling, to her left. Soleil was expressionless. and now it is the other side of me. Soleil was feeling emotions she couldn’t name, surprised at their strength. She felt a similar response from her cousin next to her. Atop that, like graffiti scratched into a mirror, was a feeling that she was overhearing someone talk about her. Like an unfamiliar voice saying something personal, right in her ear. Despite wanting to really hear the music, Soleil kept her focus ready, senses pricked. She didn’t anticipate danger, necessarily. If she had described this sensation to Arkuda, her teacher, he would have told her this was a precursor to contact with some ethereal beings. As it was, she had no knowledge, and no warning. She was in the dark. No home so wild and subtle as the shadow forest. 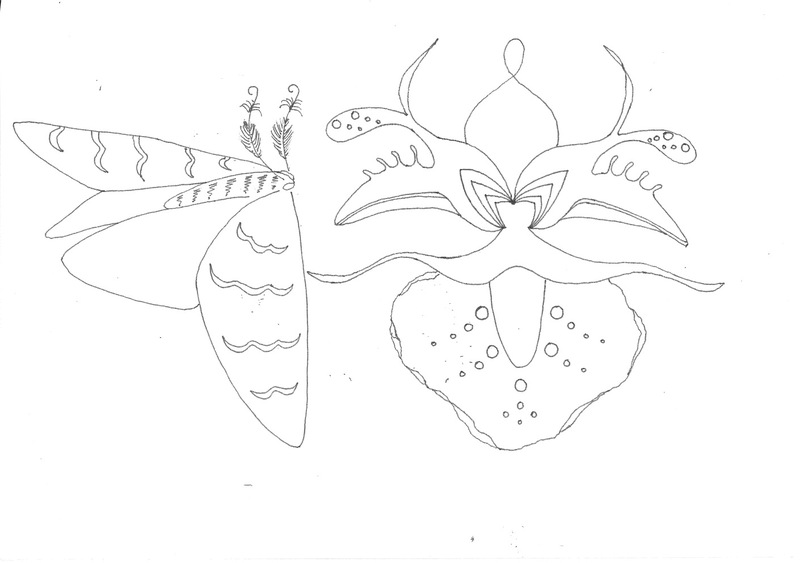 the dusk orchids and their lover moths. bodies set to the stalk and chase. this thrill is the soul of us!